If you ask a Burundian refugee who has recently arrived in Tanzania when they plan to return home, there’s a good chance that the answer will be, “I don’t.” Now a cholera outbreak on the border has made the journey all the more dangerous. Many of the 65,000 who fled there in recent days amid protests against President Pierre Nkurunziza’s plan to run for a third term and a related attempted coup d’etat have made the same hasty journey before. Tumultuous events in Burundi have prompted several huge waves of refugees: in 1972 mass killings of Hutus led 150,000 people to flee the country; 20 years later the assassination of Burundi’s first Hutu president sparked an exodus of half a million people and ignited a civil war that lasted until 2005; and amid the current political crisis, marked by a harsh police crackdown, more than 105,000 have left to neighbouring states, including Rwanda and the Democratic Republic of Congo (DRC). Many of those now leaving were born and grew up in refugee camps. “I’ve been running my whole life,” said Moise Ntiranyibagira, one of 60 passengers on a bus heading to a transit centre in the Tanzanian lake port of Kigoma. He has lived in Burundi for less than half of his 35 years. “There are a lot of us who want to stop running. We want to settle somewhere else – not in Burundi,” he told IRIN, explaining there was more to his problems than the current political unrest. As well as people, the bus is packed with luggage a kind that shows people are planning to be away for a while: solar panels, mattresses, bicycles, stoves. The current exodus has prompted a major public health crisis because of the cholera outbreak which has claimed 27 lives, according to UNICEF. Some 50,000 people are crowded into Kagunga, a Tanzanian village bordered by mountains on one side and Lake Tanganyika on the other. “Overcrowding and poor sanitation have resulted in a surge of confirmed or suspected cases of cholera and acute watery diarrhoea among the refugees…without a cholera treatment centre on site in Kagunga, mortality rates may become extremely high,” UNICEF warned in a statement. Refugees line the beach scores deep, sheltering under shade cloth and palm trees. 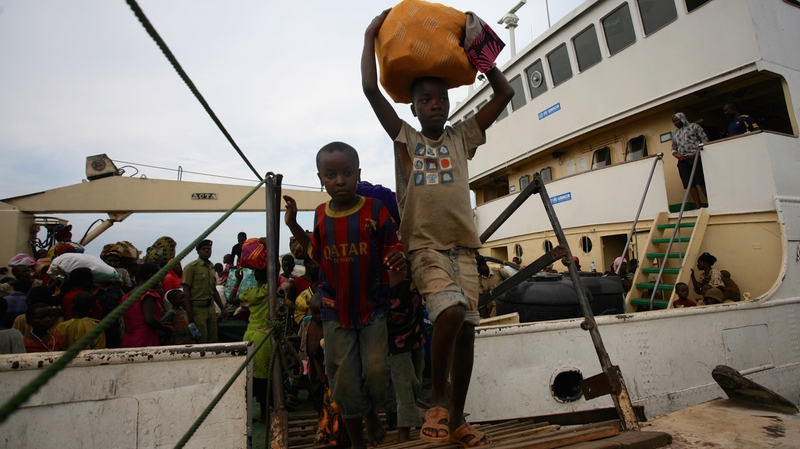 From Kagunga they are transferred by boat, at a rate of 1,500 a day to the port-town of Kigoma, where the Tanzanian government has made the Lake Tanganyika Stadium available as a transit centre. The World Health Organization has warned of a “severe humanitarian crisis” in Tanzania as a result of the exodus. On one of the boats ferrying refugees, Emablis Nyirogira from Lake Nyanza watches over his five year old son who is attached to an IV drip as his breathing becoming increasingly laboured. On the bunk next to his son is the shrouded body of a young girl who didn’t survive the journey. Land––or lack of it––is a core problem for Burundi. The vast majority of the population are small-scale farmers, but yields from tiny parcels are barely enough to live off, let alone turn a profit from. High population growth and the return since the end of the war of half a million refugees have made the issue, which is directly related to food security all the more pressing. Returning refugees have a right to reclaim land they abandoned years earlier and there is a special commission dedicated resettling returnees and resolving ownership disputes. "We've been on the run since 1965." Still, thousands of disputes remain unresolved and the commission’s rulings are frequently overturned in the courts. Aside from the land issue, returning refugees have faced a host of other challenges related to employment, bureaucracy, discrimination, language and food. He said there’s no dominant ethnic profile to the refugees. “We’re all together here, we’re just scared of the war. 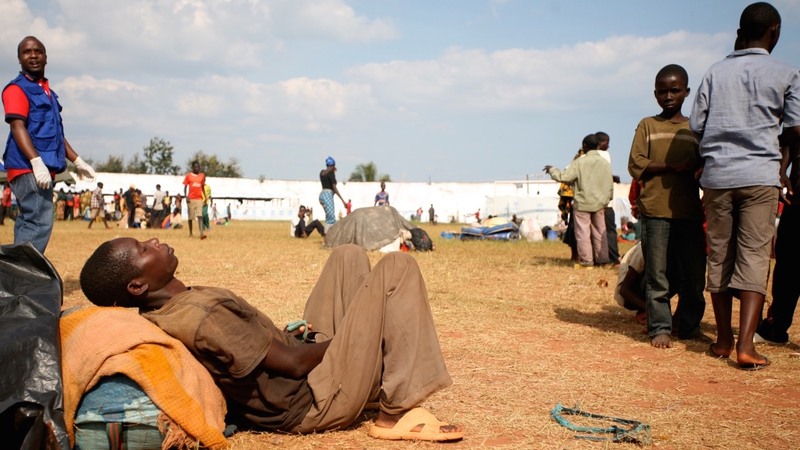 In Kigoma’s stadium, now holding 4,000 refugees, a number of people reported that the heightened presence and intervention of state security forces, especially police, was a factor in their decision to leave. They said police were blocking roads to check papers and ID, while some were soliciting bribes at roadblocks and stealing. Some said Nkurunziza’s supporters had stopped people leaving Burundi for Tanzania and that security in the southern Makamba province was deteriorating. “We’ve been on the run since 1965," said Basigivyahbo. That year, a failed coup by Hutu army officers led to purges and repression of the Hutu majority. "We’ve never been able to buy land," he added. Indeed, for Basigivyahbo, who opposes Nkurunziza’s decision to run for a third term, there is little incentive to stay: poor governance at the top of the pyramid, and not enough to eat further down. Even as a citizen of Burundi, his life entails scraping by on what he can. Many refugees spoke warmly of their earlier years in Tanzania. One woman waiting at Kagunga, , to catch a boat to Kigoma, said she plied this exact route in 1993. The Tanzanians “were so welcoming then, we considered this our best option,” she said. While Tanzania has indeed been a generous host to Burundian refugees for decades, and has recently began the process of giving citizenship to 162,000 of them it also ended the refugee status of some 40,000 Burundians in 2012.